Russian Supreme Court recalculates sentence of convicted ex- police officer | Russian Legal Information Agency (RAPSI). 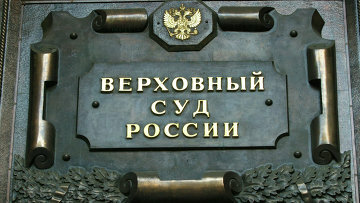 MOSCOW, September 6 (RAPSI) – The Supreme Court of Russia has recalculated prison sentence of a former officer of the Interior Ministry’s anti-corruption department Sergey Astafurov, and ex-head of the Promresource state company Vladimir Spiridonov in a criminal case over provocation of a bribe, the press-service of the court has told RAPSI. The court ruled to recalculate the sentences by acknowledging 1 day spent in a pre-trial detention center as 1.5 days in prison. The defendants will stay in prison for over 2 more years. The court’s decision is based on some recent amendments to the Russian legislation on pre-trial detention envisaging certain changes in the rules governing the set-off of the time spent in detention with respect to the calculation of prison terms. In February, the Moscow City Court sentenced Astafurov charged with provocation of a bribe and abuse of office to 4.5 years in a penal colony and prohibited him from holding law enforcement office for 2 years. Spiridonov was sentenced to 4.5 years as well. The details of the criminal case are classified, and the hearings were held behind closed doors. Investigators believe that actions of Astafurov and Spiridonov resulted in unlawful launch of a criminal case against head of the Chelyabinsk Tube-Rolling Plant Andrey Komarov and his lawyer Alexander Shibanov. Komarov and Shibanov were arrested after they allegedly tried to bribe the law enforcement officer, who became aware of violations during transfer of nearly 2 billion rubles ($34.4 million) from the state budget by one of the Plant’s subsidiaries. 14:59 06/09/2018 The Supreme Court of Russia has recalculated prison sentence of a former officer of the Interior Ministry’s anti-corruption department Sergey Astafurov, and ex-head of the Promresource state company Vladimir Spiridonov in a criminal case over provocation of a bribe.